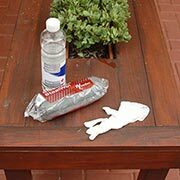 We have some pretty gusty winds lately, and if your patio cushions end up in the pool - or next door - here's a quick fix to solve the problem. If you're planning on adding an extension to your home to take advantage of the garden, look at adding a space where the whole family can spend time together. Having the space for a dedicated sunroom or garden room allows you to take advantage of our beautiful weather all year round. 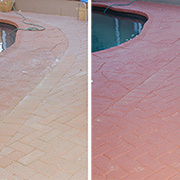 Savannah of Classy Clutter transformed her concrete slab patio with paving bricks and the transformation is amazing. Are your outdoors ready for summer? 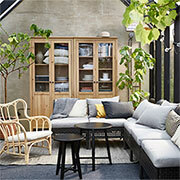 Temperatures are rising and we are spending more time outdoors in the garden - is yours ready for the summer? 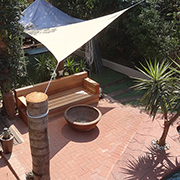 Our South African climate can be harsh on garden furniture - any type of furniture - and there will come a time when your garden furniture needs tender loving care to make it look good again. 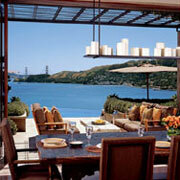 Designing an outdoor room is the perfect way to spend more time outdoors during the Spring and Summer seasons. 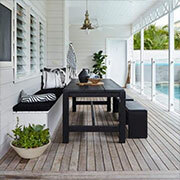 Winter (if it's dry) is the perfect time to get outdoors and restore your deck for the year ahead. 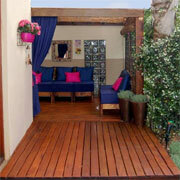 South Africans spend a lot of time outdoors - even in winter, so use these tips to add warmth to a patio or deck. Summer is in full swing and the days are long and hot. 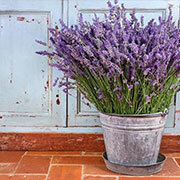 Your garden is the most important 'room' in your home during the spring and summer months. 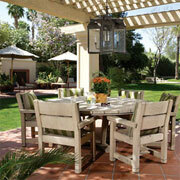 It's where you can create the perfect outdoor living space. If you're thinking of building a deck during the holidays, here are two essential tools you need to get the job done right. 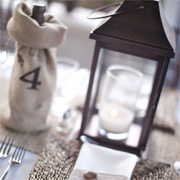 Add a little magic to your garden for the festive season, or simply to add a little glow to your outdoor entertaining areas. Summer means spending lots of time outdoors. It's also when uninvited guests like mozzies and flies like to crash the party. Here are some tried and tested remedies to keep bugs at bay. 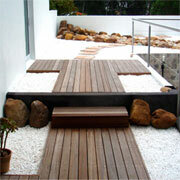 South Africans are warming up to the beauty of outdoor decks as an alternative to other materials. 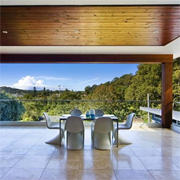 A beautiful wooden deck adds another level of natural texture to any outdoor space. The perfect patio takes planning with a clear idea of what you'll use the space for. 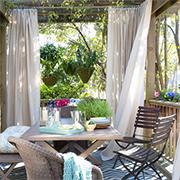 Here are a few tips to design a patio that will be perfect for family brunches, an afternoon with friends, or a heart-to-heart on cool evenings. 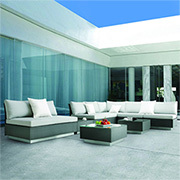 Not all cushions for patio furniture are fitted with a zip that allows for easy cleaning. 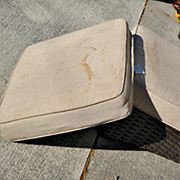 Here's a way to refresh the cushions for your patio furniture to have them clean for summer. 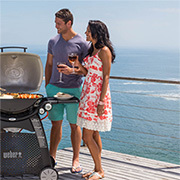 September is Braai Month, and if you're looking to buy a new braai, here are some tips on choosing the right braai for at home or away. 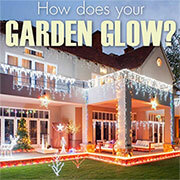 Summer is almost here, and we offer some tips on lighting up the garden for security, safety and entertainment. 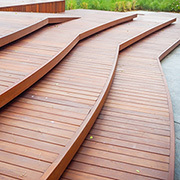 While timber decking is most often associated with leisure and entertainment, and considered a complement to a larger structure, the importance of correct deck building is not always fully appreciated. 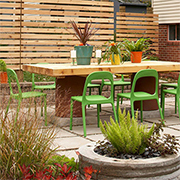 Garden furniture might look the same, and you may be tempted to buy based on price, but here are some things you need to know before you buy. 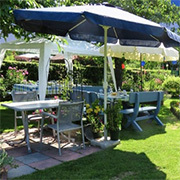 With spring on the horizon, it soon going to be that time of year when the days are long and the weather is warm and we spend a lot of time outdoors in the garden. Before you know it, summer will be upon us and you will be spending more time outdoors. 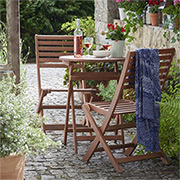 Now is the time to do any maintenance to make sure your outdoor furniture is protected against the elements - rain or sun! When your outdoor furniture is starting to lose it's shine and the rainy season has taken a hiatus, it's time to grab a can of Woodoc and protect and nourish outdoor furniture. 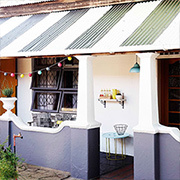 See how a Victorian stoep gets a colourful and much-needed makeover with a few cans of paint. 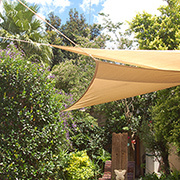 The past couple of summers have definitely been getting hotter, and at a cost of around R500, a shade sail is one of the cheapest and easiest DIY solutions for shade in a garden. 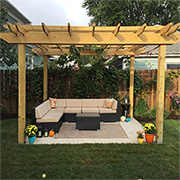 If you get cracking now, there's still time to build a pergola for outdoor entertaining. 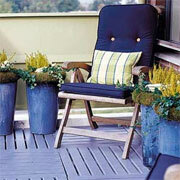 Plant a fast growing creeper and you will soon have a shady spot to sit and relax. Continuing with my winter maintenance projects, it has been almost two years since I paved the outdoor patio area in my garden. 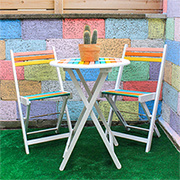 Using Prominent Paints paving paint, the area now looks ready for summer entertaining. 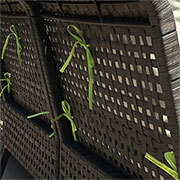 Thatch lapas are a popular choice for adding a covered entertainment or extra living space to outdoor areas. 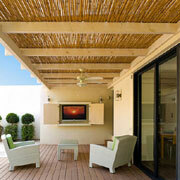 The natural insulating properties of thatch create a structure that is cool in summer and warm in winter. 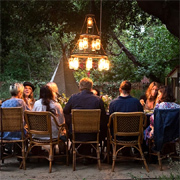 The summer heat wave continues unabated and we are all looking for a cool, shady spot to relax and beat the heat indoors. 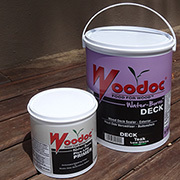 Woodoc have done it again, with a range of Woodoc water-borne exterior sealers that offer maximum protection for decks and exterior timber. 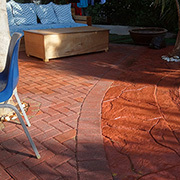 The newly paved outdoor area is designed to provide more open space for seating and raise the level of the ground to allow for water drainage problems. 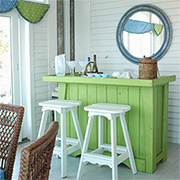 Transform outdoor areas into comfortable living spaces using decor accessories and recycled materials and some DIY savvy. 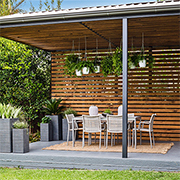 Whether you renovate an existing carport into a patio or decide to have a basic carport erected, the simple design of a carport allows you to set up an easy patio area in a small or large garden. How to fit a shade sail ! So, I rushed out and bought a shade sail at my local Builders Warehouse, only to find that the sail was far too small and didn't even offer shade over the area that needed to be covered. I made my own outdoor patio furniture! 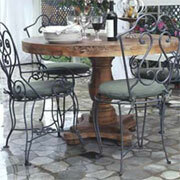 A few months back I featured an article on making your own designer patio furniture. I did mention that this was my dream patio suite and that I would be making my own patio furniture when time allowed and I have now completed the sofa part of the suite. 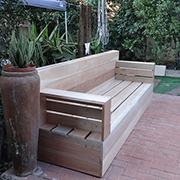 When you haven't nothing more than a concrete slab for a patio, it's nice to know that there is something you an do to transform the space into a lovely outdoor area that has everything you need to sit outdoor during the spring and summer months. Yesterday was a beautiful spring day and looks like it will be the same today, and made me realise just how lucky we are to have weather that allows us to spend a great deal of time outdoors. Spring is almost upon us and warmer days are not far away. 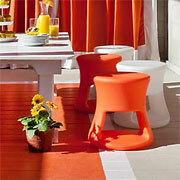 If you have ideas for your outdoor spaces, now is the time to get cracking. 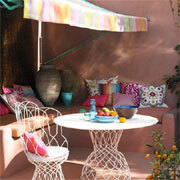 Turn that boring outdoor area into a relaxing spot to laze away summer days or entertain on balmy evenings. 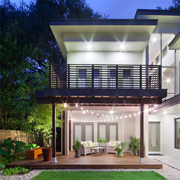 A courtyard with concrete slab floor was transformed from a dull and dreary outdoor area into a multi-level entertainment space. The entire project involved a DIY deck installation using pine wood planks in two widths and on varying levels. 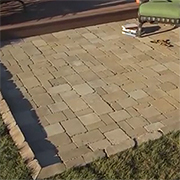 If you don't already have a paved or concrete patio, using cement paving bricks, clay bricks, or even reclaimed bricks, is an affordable and reasonably easy project that can be done in a weekend - or two - tops! 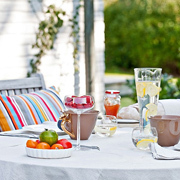 As we head towards autumn and the weather starts to cool down, set up your garden for an afternoon or evening's get together with family or friends. When the hot summer sun beats down you need a place to take respite that's cool and relaxing. 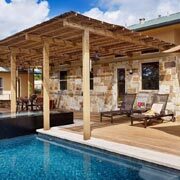 A structure, whether fixed or freestanding, natural or constructed, should provide enough shade to cool down your guests or family and stay out of the sun's harmful UV rays. 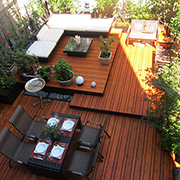 Transform a deck for patio into the ultimate outdoor space for your family - or for entertaining friends. 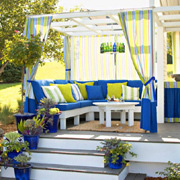 With some DIY creativity you can create the ultimate outdoor space. 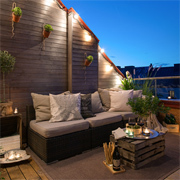 Living in a flat or townhouse might only offer a small balcony to sit outdoors and enjoy the sun, but that doesn't mean that you can't make the most of the space. Even a tiny balcony that only seats two - at a squeeze - can still be dressed up and made comfortable. 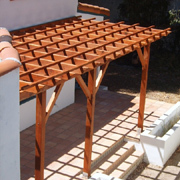 Browse the Internet and you will find plenty of projects that show you how to build a pergola, some of which range from designs that will blow over in the wind. Wood needs a regular application of nourishing treatments to protect and preserve, so here's how to get your wood deck looking good for the holidays. Choosing the right floor for your patio or entertainment area can be as difficult as selecting the right flooring for your home interior. With any flooring choice their are pros and cons as to durability, maintenance, appearance and safety. 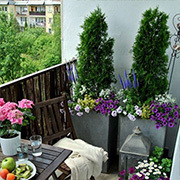 A medium or large size balcony can be decorated to provide additional living space. Use your imagination to design an outdoor living area that fits within the space and provides comfortable seating and a place to relax in the cool evenings. 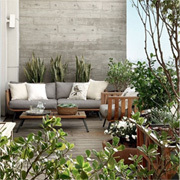 Today's outdoor areas are more than just a walk in the garden. They are just as much a part of house design as any room in the home. 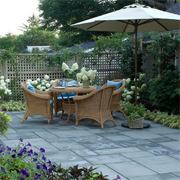 Small or large, gardens are being utilized for extending outdoor living spaces - and with our beautiful climate, why not? Decking: Finish or leave unfinished? 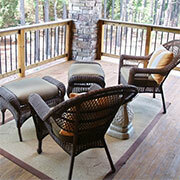 Decks are becoming a popular choice for adding an entertainment or additional living area to a garden. But if staining or sanding aren't something you're willing to do to keep the deck looking sharp, you need to carefully consider your choice of deck material. You can use today's paints to transform any feature in a home and today we look at how to paint a porch, whether it's concrete or wood. 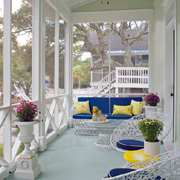 We show you how to use Plascon Floor Paint and Plascon Velvaglo to transform a drab and boring porch floor. 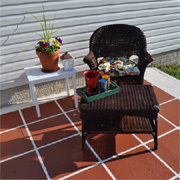 There's no reason why you can't paint a design onto a concrete slab or patio, in fact, painting concrete is a quick and easy way to update a boring concrete slab. I have a garden shed, but it doesn't look anything like this one. My garden shed is packed to the brim with stuff that has nowhere else to go. 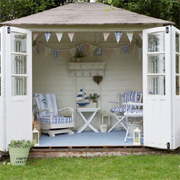 But I love the idea of buying a ready-made garden shed and transforming it into a sanctuary for the garden. 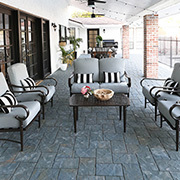 It might be getting chilly outdoors but now is the perfect time to start planning for that patio you've always dreamed of. 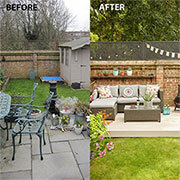 If you start on the project now - your new patio will be ready for action as soon as warm weather arrives. 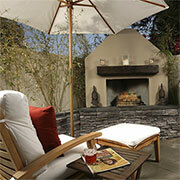 When planning or designing a patio area for a small garden take into consideration that sometimes less is more. 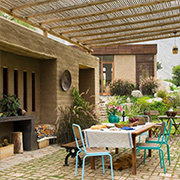 With the right materials and clever planting, even a small patio can feel more expansive. Building a deck is a project that can be tackled over a weekend - for a small one - or over a couple of weekends for a larger deck. 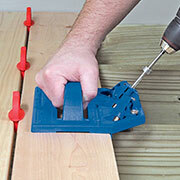 Making your own deck can save you thousands of rands and is not as difficult as you may think. Spring has sprung and summer is just around the corner. 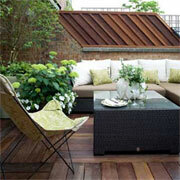 You've already realised that it's time to put a roof on the patio so that you can spend more time outdoors. But what roof options are there...? 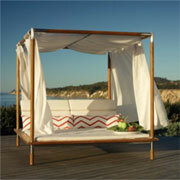 What could be more luxurious than having a daybed to relax on when it's sunny and hot. 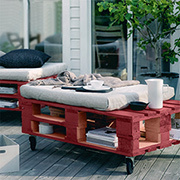 You can design and build your own daybed using a variety of materials. 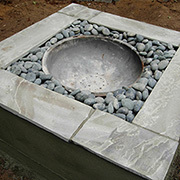 If you have welding experience, you can design a bed using square or round steel. Not only gorgeous to look at, building your own freestanding deck allows you to set up an entertainment area wherever you like, without having to spend money on plans and waiting months for approval. 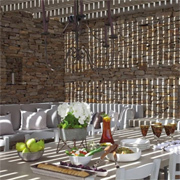 As South Africans, we spend a lot of our time outdoors, so it makes sense to design an outdoor space - a patio - that provides everything we need for spending time in the garden relaxing or entertaining friends and family. Having to host a large party at home, Roberto Gil decided to get creative rather than hire an expensive marquis for the event. 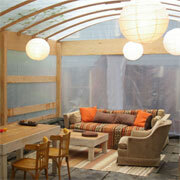 He built an enclosure out of marine plywood and transparent plastic sheet. When the rainy season is over, this is the perfect time to tackle maintenance and repairs that need to be done, and while it is true that maintenance can be labour intensive, with the right equipment and the proper products on hand you can easily tackle this project over a weekend. 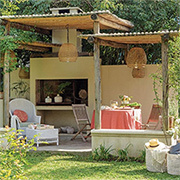 South Africans are lucky enough to have beautiful weather for most of the year, and it makes sense to use whatever space is available outdoors to not only take advantage of this, but also to extend living spaces. Here's how to build your own deck. My new deck took approximately two weeks from start to finish and came in at well under R10,000 for a complete entertainment area that is covered and decorated. Creating a separate space in the garden gives you a great getaway for work, hobbies, or just some piece and quiet. It's the time of the year when spending time outdoors is getting a bit on the chilly side, but it's a great time to think about the spring and summer months ahead. 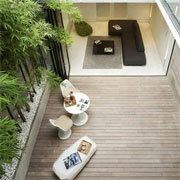 Want to create a room that blends seamlessly with the garden beyond? Doing so will make your interior space feel bigger, brighter and contemporary - and it will draw attention to your garden beyond, too. 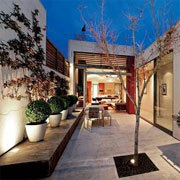 If your home does not have the luxury of large, open living spaces look to the garden to add on to your home. This is definitely a more affordable option than building extra rooms. The moment I saw this courtyard garden I fell in love! Designed by talented architects from Ong & Ong Singapore, this is a stunning, truly breathtaking property - with everything designed to perfection. 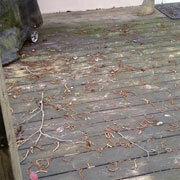 Deck in need of some TLC? Refinishing your deck regularly, usually every eight to twelve months, avoids cracking and splintering of the wood, keeping the surface of the deck attractive and safe. 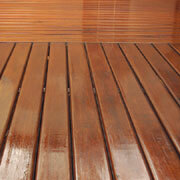 Check out Woodoc's guidelines for refinishing a deck. 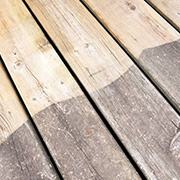 Exposed to extreme climate, excess moisture and exposure to harsh UV sunlight, your deck can easily become worn and faded. But you can transform your deck in no time at all, by performing annual maintenance to keep it looking beautiful. 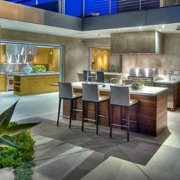 Concrete is a sturdy and durable floor for a patio, but it’s certainly not charming. 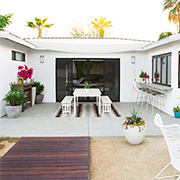 Learn how to transform your concrete slab into a faux-stone living space. 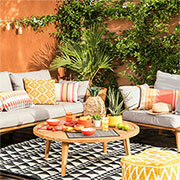 Tie all your garden accessories together with an outdoor rug. 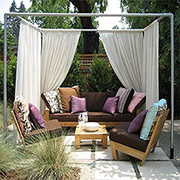 It is possible to transform any backyard or patio space into something that can make the entire home space more enjoyable. 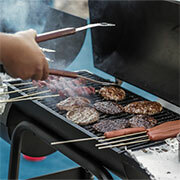 With a good pellet grill you can smoke your food to mouth-watering flavors that will not only make you feel like you’re a child again but make loving memories with the entire family. 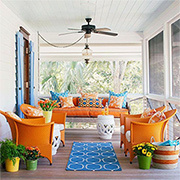 We are going to share some tips that will help you make your outdoor living space the go-to attraction this summer.